All the planning and idea of the Delhi University to introduce new admission system from this year is now in vain. From the past one year, Delhi University was working to introduce a new admission process from the year 2017 -18. In fact, there were headlines that the Delhi University Admission in the undergraduate programme will now be conducted on the basis of an Entrance Test which is likely to be called Delhi University Entrance Test (DUET). However, the plan is now in profusion. The admission is unlikely to see any major change this year and hence remains the same. The admission in the Delhi University for the undergraduate courses is still invited on the basis of Class 12 merit only similar to the one carried in last year admission process. The admission process will continue to stay online but now each aspirant will be allowed to submit only one form. The authority has also decided to make Aadhaar mandatory for the application level. What are the reasons for the abundance of the plan? According to the sources, the university set up an admission committee in 2016 and it is yet to finalise its recommendations. The main reason behind the non-implementation of the idea of the new admission process is that all the members of the team were not on the same page on several issues which included the introduction of the test for UG admission. Reasons for delaying the DU Undergraduate Admission 2017 process? In the starting of the year, there was another ball game. Officials of the university were then hopeful about starting the application process early this year. Traditionally, by the first week of April, the team announces the admission process for entrance tests for BA (H), Business economics (BBE), Bachelor of Business Studies (BBS) and the Bachelor of Financial and Investment Analysis (BFIA). This is also likely to be delayed until the first week of May as tests are to be outsourced along with Delhi University Entrance Test (DUET) 2017 meant for the postgraduate and research programmes. What has officials to say about the delay in the DU Admission process? 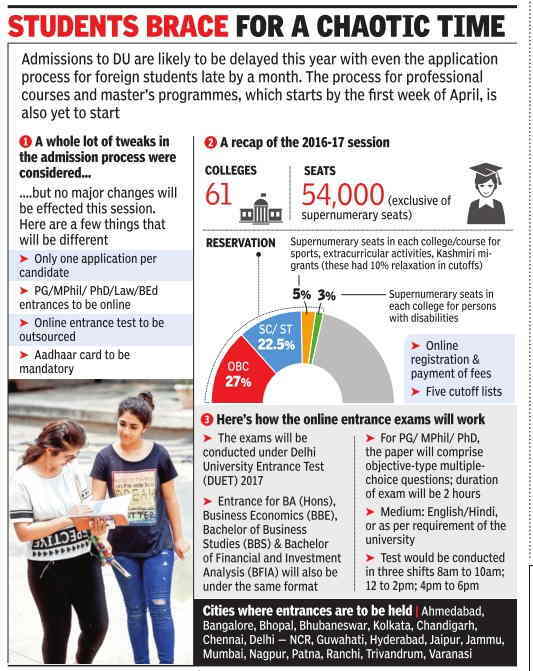 “The online entrance for masters and research programmes will be like a pilot project before its probable extension to the undergraduate courses next year,“ said a senior official of the examination branch of DU. A senior official claimed that the university had failed to advance the admission process but there won't be any delay in case of UG courses. The university is likely to announce the detailed process by the first week of May once the admission committee finalises the recommendations said a source.